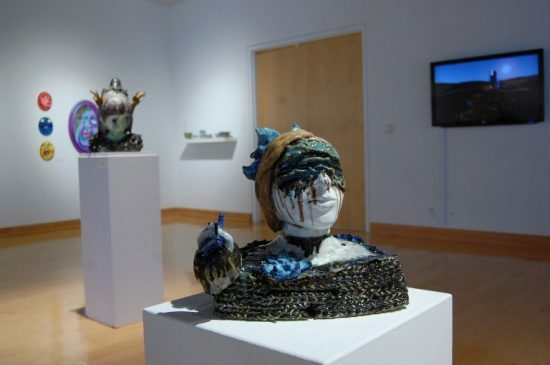 The Betty Foy Sanders Department of Art (BFSDoArt) is hosting the annual Juried Undergraduate Exhibition, a showcase of artwork from undergraduate students, in the Center for Art & Theatre’s Contemporary Gallery through April 7. Blankenship and Oren will each receive a solo exhibition at the Averitt Center for the Art, Legends Gallery during the 2017-2018 school year. Other students whose work was is showcased in the exhibit include: Soleil Collins, Charlynne Crutcher, Anna Currence, Allison Exley, Alex Furloug, Rikki Hagerty, Jessie Hamne, Tanner Higgs, Carter Jackson, Jennie Klabnik, Savannah Knauss, Denson McLain, Kimberly Powell Page, Keyanna Palmer, Ray Pettit, Kasey Roberts, Raegan Rowland, Allyson Schuman, Madeline Shelor, Sarah Shepherd, Virginia Skinner, Dylan Stembridge, Tanner Tracey, Stefani Waters, Shelby Whitaker and MacKenzie Willard. In addition to the Juried Undergraduate Exhibition, students could submit work created in foundations courses such as Drawing I, Drawing II, 2D Design and 3D Design throughout the 2016/2017 academic year for the Form & Content exhibition, on view in the University Gallery through April 7. Form & Content was juried by national artist and University of South Carolina Professor of Sculpture Naomi Faulk. Each received a gift bag from Blick Art Supplies. Other students with work selected for this exhibition includes: Jenna Bloser, Shelby Bragg, Rakel Brown, Peyton M. Butts, Emily Coats, Soleil B. Collins, Charlynne Crutcher, Kristen Daniel, Lindsey Dalton, Anna DeLoach, Paige Distler, Lisa Edwards, Juanita Fludd, Lauren Friedlander, AnnaBrooke H. Greene, Gabrielle Kastner, Samantha Lanza, Ryan Lee, John R. Lewis, Maya Malins, Isabel Massell, Tanner Maxey, JD McCarthy, Anna Merritt, Stefan Olsson, Caleb O’Neill, Madeline Owens, Adam Sapp, Caitlin Shelby, Allison Vagase, Clint Wells, Andrew Wiggins and Jodie Wisner.